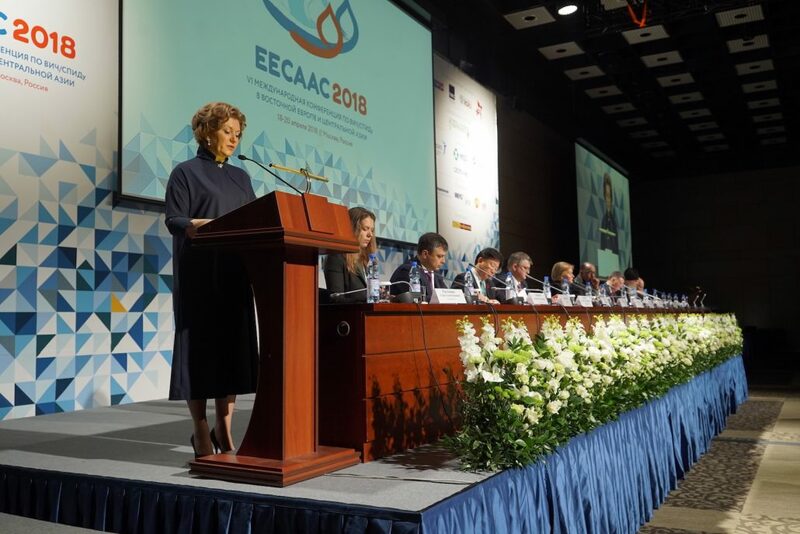 On April 18-20, 2018, Moscow hosted the VI International Eastern Europe and Central Asia AIDS Conference (EECAAC 2018). Nearly 3000 delegates from 63 countries gathered at the forum. Conference attendees included the world’s leading scientists, politicians, representatives from international organizations and civic leaders. The motto of the VI Conference – “Mobilizing resources: experience, investments, innovation”. The Conference focused on four tracks: “Science and Medicine”, “International Development Assistance”, “Effective Prevention” and “Civil Society”. These tracks covered the most important areas related to HIV infection. Based on the Conference results, the co-chairs of the Organizing and Program Committees adopted a Final statement of the Conference, which affirmed the commitment of the region’s countries to achieving one of the SDG tasks: putting an end to the AIDS epidemic by 2030. “The VI Eastern Europe and Central Asia AIDS Conference is a great starting point for intensifying the HIV response in Russia and around the world. We are pleased to contribute to international efforts in this field by bringing together famous football players, politicians, and everyone who wants to play an active role in fighting AIDS and discrimination. I hope that our joint efforts will impact preventing all forms of discrimination,” said Arkady Dvorkovich, Deputy Prime Minister of Russia and Chairman of Russia’s Organizing Committee for the 2018 FIFA World Cup. Olga Golodets, Russian Deputy Prime Minister for Social Affairs, opened the Conference with EECAAC 2018 co-chairs Anna Popova, Head of the Russian Federal Service for Surveillance on Consumer Rights Protection and Human Wellbeing and Chief State Sanitary Officer of the Russian Federation, and Michel Sidibé, UNAIDS Executive Director. Welcoming remarks were also made by Ren Minghui, Director-General of WHO on HIV/AIDS, tuberculosis, malaria and neglected tropical diseases, representatives of the ministries of health of Armenia, Belarus, Kazakhstan and civil activists. “The Moscow Conference remains the key mechanism for development cooperation on combating the spread of HIV in Eastern Europe and Central Asia. Over these three days we will carry out a comprehensive analysis of the challenges associated with HIV infection in the world and in this region, as well as define the priority vectors of actions to overcome them. HIV infection has been a global health issue for more than 35 years. No country can afford to ignore this epidemic”, stressed Anna Popova. The first day was devoted to a review of the HIV situation in the region in terms of epidemiology and treatment, as well as the prospects of achieving the “90-90-90” goals in the context of the universal coverage of health services. The second day of the Conference was the most eventful. Delegates discussed science-based approaches and effective mechanisms to stop the HIV epidemic in the region. One of the key events of the second day was a press-conference with the world’s leading scientists, attended by Sharon Lewin, Director of Peter Doherty Institute for Infection and Immunity, Australia; Salim Abdul Karim, Professor of Clinical Epidemiology, Columbia University, CAPRISA Director, South Africa; Vadim Pokrovsky, Head, Federal Scientific and Methodological Center for AIDS Prevention and Control, Russia; Peter Reiss, AIDS 2018 Local chair, Professor of Medicine at the Academic Medical Center (AMC), University of Amsterdam; Stefano Vella, Director of the Center for international health, the National Institute of Health, Italy, and Chris Bayer, 13th President of the International AIDS Society (IAS), Professor at the Bloomberg School of Public Health. John Hopkins, USA. Speakers discussed promising development of prolonged action ARV drugs and HIV vaccine, as well as the appropriateness of PrEP use in the countries with insufficient treatment coverage. The main theme of the third day was the future prevention, diagnosis and treatment of HIV infection, and existing barriers to the objectives laid out by the international community. The “Open discussion platform” worked all three days of the Conference. Invited experts discussed the role of sport and football in the struggle to end discrimination of people living with HIV, history of the development of the HIV epidemic in the region and the role of youth in HIV prevention. The closing ceremony was conducted by Gennady Onishchenko, first Deputy Chairman of the Committee of the State Duma, Irina Bragina, Deputy Head Federal Service for Supervision of Consumer Rights Protection and Human Well-being, and Vinay Saldanha, UNAIDS Regional Director for Eastern Europe and Central Asia. EECAAC 2018’s closing ceremony featured the international “FASHION AIDS LINE” contest. The winners of the design competition, organized in partnership with the national fashion weeks in Armenia, Belarus, Moldova, Kazakhstan and Kyrgyzstan presented their works in Moscow along with their Russian counterparts.